"Domenic Stansberry and Eddie Muller deliver genuinely haunting noir fiction, Michelle Tea does a nice modern-day homage to the form, and Peter Plate nails down the violently absurd Willefordian side of the genre with a tale about a Bad Santa knocking over a pot club." Eddie Mullers "Kids Last Fight" is a twisted tale about a sociopathic Asian gang member out to make his bones, a distracted Yuppie shopper and an aging former boxer who possibly took a few too many shots to the headall on a collision course. Pruning shears figure prominently, and youll both laugh and cry at the ending. A real San Francisco treat. An anthology of dark stories by Barry Gifford, Robert Mailer Anderson, Michelle Tea, Peter Plate, Kate Braverman, Domenic Stansberry, David Corbett, Eddie Muller, Alejandro Murguia, Sin Sorracco, Alvin Lu, John Longhi, Will Christopher Baer, Jim Nisbet, and David Henry Sterry. San Francisco Noir lashes out with hard-biting tales exploring the shadowy nether regions of scenic "Baghdad by the Bay." In this superb collection, virtuosos of the genre meet up with the best of S.F. 's literary fiction community to chart a unique psycho-geography for a dark landscape. From inner city boroughs to the outlands, each contributor offers an original story based in a distinct neighborhood. At times brutal, darkly humorous, and revelatorythe stories speak of a hidden San Francisco, a town where the fog is but a prelude to darker realities lingering beneath. 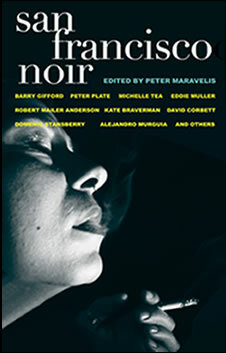 SAYS EDDIE "It's an intriguing collection that displays the elasticity of the term "noir." Peter Maravelis, the editor, specifically asked me to contribute something that touched both on old San Francisco and boxing. I didn't want to do another period story right now, so I combined some of my feelings about the city today with my mother's battle with Alzheimer's disease and turned it into story. I intended it to be longer, but the story surprised me – it knocked me out, like a short left hook you don't see coming. The title, "Kid's Last Fight," was taken from a poem my father used to recite at the drop of a friggin hat."